Ted was sent this picture of 'Tishy' no. 25672 by Neville Stead who wants to know the location. The engine was originally built in March 1916 as no. 867 Condor. It was rebuilt as a 'Tishy' with outside Walschaerts valve gear in March 1923, becoming LMS no. 5672 in October 1926 and no. 25672 in January 1934 according to Baxter, 3rd April 1934 according to W. L. Harris. It still has its LNWR shed plate '30' Salop on the smokebox door, which would have been replaced by a cast-iron LMS plate '4A' in 1935, so the date is fixed fairly precisely. According to Baxter, it lost its name in July 1933 but it seems likely to have been earlier than that as the 'Royal Scot' no. 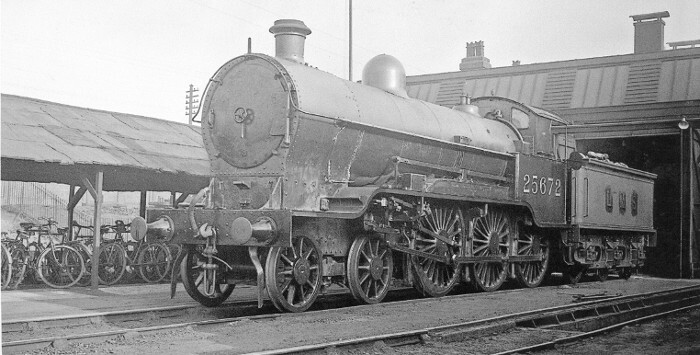 6145 was named Condor in 1928 (Engines of the LMS built 1923-1951, R. Rowledge). With the bicycle shed and footpath to a higher level on the left and chimney pots above the shed roof, it should be fairly easy to pin the location down but so far it has defied identification. This is Crewe South Shed, north side. The same (unique?) arrangement of windows and smoke vents on the north-light roof, together with the office chimney-pots beyond, can be seen in other photos of this shed. In the distance, under the bike shed roof, the Carriage Shed can be seen, on the other side of the (hidden) main-line tracks.